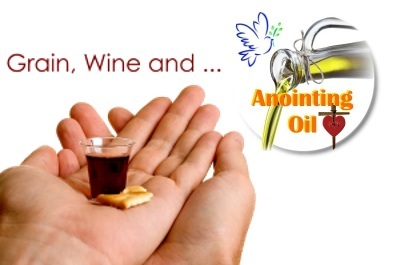 Grain, Wine and Anointing Oil - POWER! Beloved, the oil, bread and wine represent Jesus’ finished work at the cross. Jesus provided His own body to be punished for the healing of your diseases and afflictions. Rest in the reality that by His stripes you are healed! Giving out Anointing Oil is a great gift for any season ... perhaps for Christmas? Don't give gifts that perish ... aka bouquet of flowers. A tasty cake makes a better choice, I think, so is a bottle of good wine. We can customize the labels for the Anointing Oil. Talk to us!